Last weekend Chris and I joined Kimi and her family for lunch at this tapas place. One of the many delightful dishes we tried was a small plate called Fried Duck Egg, Chorizo Cracklings, Toast. It was such a simple yet tasty dish that I wanted to recreate it at home. I managed to score some duck eggs at my butcher. I’ve been meaning to give duck eggs a try but I just didn’t know how to prepare it or what to expect. Duck eggs are slightly bigger than chicken eggs. It even has a very distinctive looking shell, almost muddy looking (white) and big. Big and very dense, not to mention heavy. The yolks are also bigger than regular chicken eggs but mighty fine tasting. You can definitely make this dish with chicken eggs but if you can get your hands on duck eggs, try it with that. This can easily be served as an appetizer or a brunch item. Enjoy your week! Preheat the oven to 350 degrees F. Center the oven rack. Line foil on a baking sheet. Arrange ciabatta on the baking sheet and bake for 3-5 minutes or until edges are slightly golden brown. In two 6-inch mini cast iron skillets over medium low heat (my burners are big so there’s no need to turn the heat up high), split the minced chorizo in half and cook chorizo in each skillet until it renders off some fat and is slightly crispy. Use a slotted spoon to transfer chorizo to a plate. Crack one duck egg in each cast iron skillet and fry until eggs are set or until desired doneness. Slightly season with salt. Be sure not to overcook the yolk, it needs to be a bit runny when you eat this with your toast. 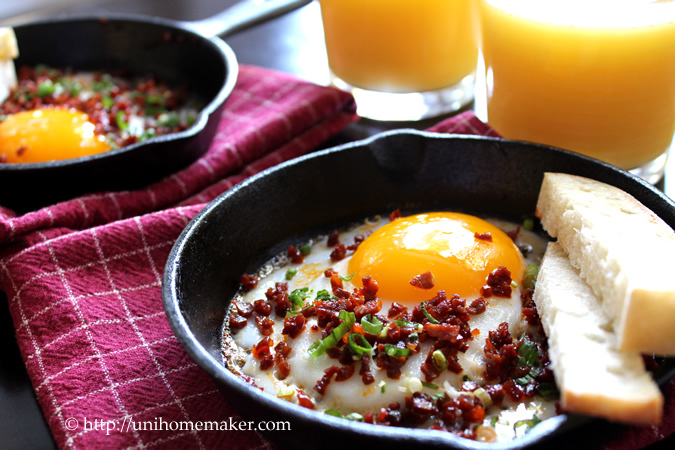 Once cooked, top the eggs with chorizo and chopped scallions. Serve this in the cast iron skillet with toast. Alternatively, you can cook this in a regular skillet and serve this on a small plate 1-2 eggs per person. I’ve never tried duck eggs but am intrigued now. I will try to find some next time I’m at the market. Oh my god how delicious r those eggs. Looks delicious. I’ve never tried duck eggs. Intresting Anne,never tasted THE egg of duck,must be very nice!! !thank you for sharing. wow. so impressive looking. love the little cast iron skillets! perfect looking presentation. OH, Anne, this looks delicious for an egg-lover like myself. I have never tried duck eggs, but I cannot but love them! Such pretty pictures too. Haven’t had duck eggs in years. I do like them, as an Aunt used to keep ducks and geese. I remember them being filling, or maybe that’s because I would’ve been quite young. I’ve never had duck eggs before but this looks so delicious! Pretty pictures and love your skillets! Your mini cast iron skillets are fantastic! I love your version and it’s beautifully photographed. I haven’t used chorizo in anything in awhile…I’ve got to add it to this week’s shopping list! damn, i love the runny duck egg yolk, my chidhood habit to drizzle the yolk on toasted bread, yummy! I love duck eggs. I have you tried the Salted Chinese kind? Actually I have not. Although I have seen them around. That looks brilliant, I can almost taste it! 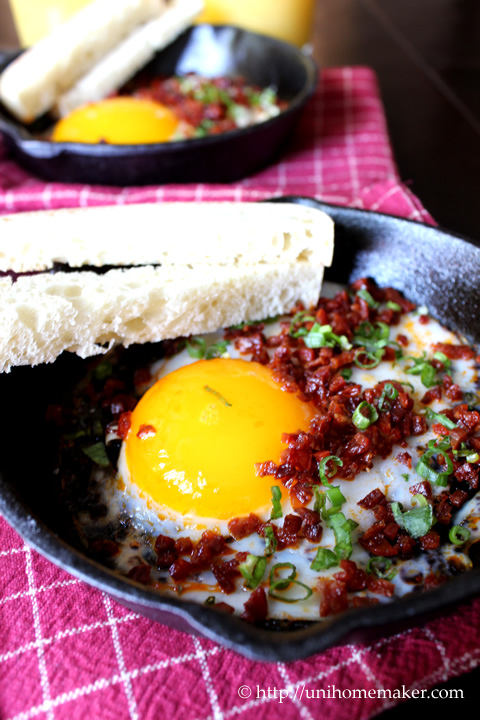 I love chorizo, and seeing them sprinkled in bits over that egg… Oh! Wish I could dip some toast into that yolk, like, NOW! Beautiful photos!! You gotta love that egg yolk, man those things are HUGE. I wonder what a fried duck egg over a burger would taste like. Epic? I love the simplicity of this and yet it looks soooooooooooooooo good. Your photos are fantastic Anne! Duck eggs also have a richer taste, right? We have loads of salted duck eggs but I’ve never seen fresh duck eggs around. I’m pretty sure it’s ah-mazing! I remember having salted and fresh duck eggs as a child, this does bring back good memories! Can’t say I’ve had salted duck eggs but I LOVE the fresh ones. I was hooked just reading the title of this post. And then I saw the photos….. Stunning! I have definitely never seen duck eggs around before! sounds like a great breakfast! 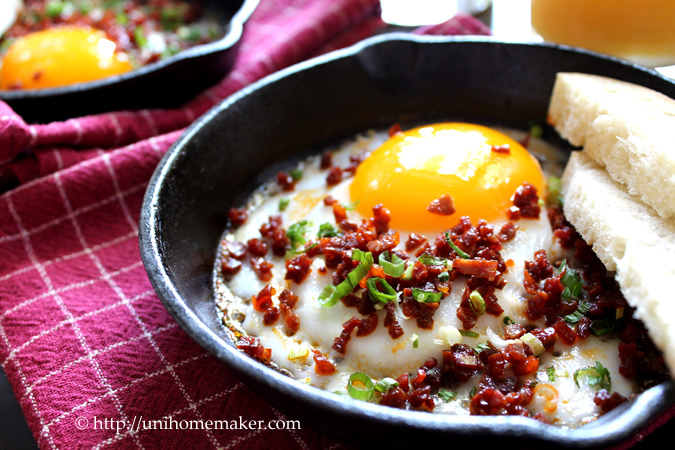 I never tried duck eggs, but with chorizo and cracklings any type of egg sounds amazing. It looks so tempting! 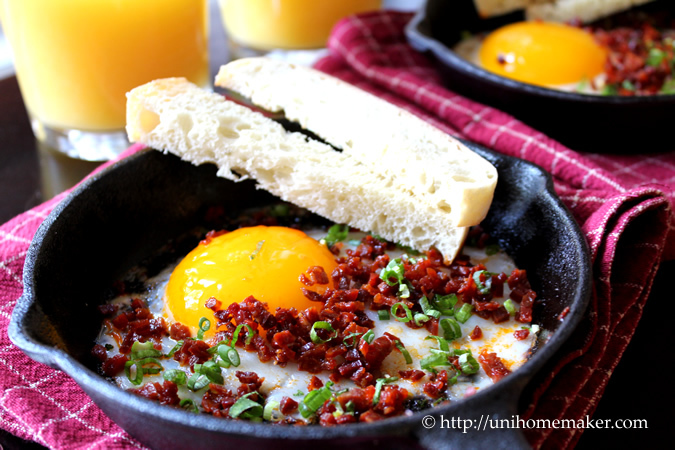 My husband absolutely loves breakfast and anything with Chorizo would be tops on his list. What a great combination of flavors & textures. I’ve never tried duck eggs before. Wow this looks so good! I wish I could have a plate of it right now! Oh how intriguing! Looks absolutely delicious, dear Anne. Curious, how does the duck egg compare in taste to a regular chicken egg? I have heard that it’s not as light and a bit game-ier? Is that true? And chorizo … delectable! Big hugs, Anne; hope you are having a fabulous week =) xo! Hi my dear Christina! Duck eggs, in my opinion, is richer. I don’t think it’s game-y, as I bought them fresh from the butcher. Thank you so much for taking the time to comment. BIG hugs back to you and have a great rest of the week! 🙂 xo! This is such a gorgeous dish!! I have never had duck eggs before..I’m curious as to how they taste! Thanks Ashley! Duck eggs are richer (and bigger), in my opinion, compare to chicken eggs. This looks so crazily good! So good that I wanted to lick the screen! Looks delicious, I never had duck egg this way. I’ve eaten many duck eggs before but usually either preserved, or steamed whole and eat with other seasonings. I gotta give this a try next time. Sounds and looks delicious. A great dish for brunch, in deed. Oh lorrrrrdeeee…. I must have this! Like right now. SO gorgeous, friend! This honestly would be the perfect breakfast for me! Chorizo cracklings – awesome term and perfect flavor booster. For Cinco De Mayo, we’re doing something on Chorizo Tacos and will definitely cite your post! Oh…Em…Gee…This looks absolutely mouth-watering. Anything with a fried egg always caught my attention. That’s why I love Bibimbap. Thanks for liking my post on that, btw. I’ve started subscribing, your blog is filled with excellent cooking! Fantastic recipe for Brunch Week! Duck eggs have the best yolks and I wish they were easily available, but then if they were then they wouldn’t be special would they! Your recipes are fantastic! This is a great idea for a brunch item – so unique. I only recently discovered duck eggs, and am always looking for a way to use them. 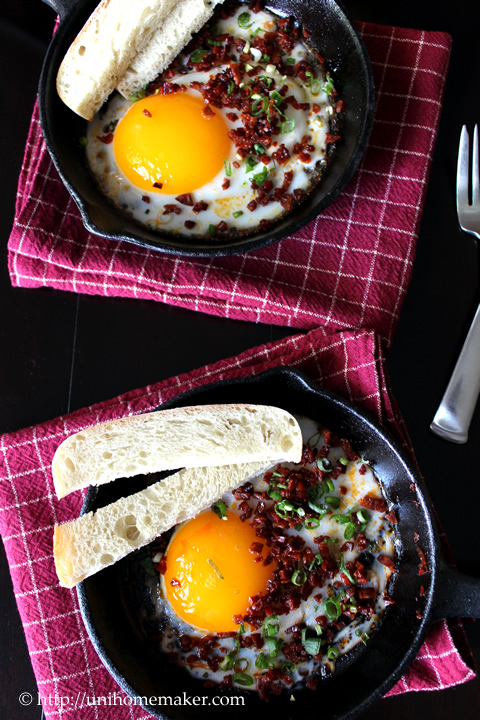 They do have such a nice, rich flavor and those big, bright yolks – love it!